VintageView has designed this rack while keeping elegant design in mind. This rustic black VintageView 6 bottle* wine rack features scroll work on the top to finish off their most popular size with a little grace. VintageView has designed this rack while keeping elegant design in mind. This rustic black VintageView 6 bottle* wine rack features scroll work on the top to finish off their most popular size with a little grace. As always this innovative racking system stores bottles with the labels facing out for a dynamic presentation and easy accessibility to the wine you want. Exceptionally flexible, easy to install and surprisingly affordable, stores from as few as 6 bottles to many thousands when used as a system. It also provides the perfect airflow between bottles. Bottle capacities are maximums when storing standard Bordeaux 750mL bottles. can this rack be mounted on either a right or left wall such that the bottles necks will still face forward? BEST ANSWER: The VintageView Le Rustique 6 Bottle Wine Rack can be mounted either way. The base strip and neck strip can be installed in either direction. I have attached the instructions for you. I suppose so. I've never mounted them to a wall. I make wine racks with them by mounting them on wine barrel staves then mount them to a flat wall. Do you make shipping to Israel? BEST ANSWER: Yes it is possible to ship to Israel. We would need to get a quote. You will have to ask them. I live in the U.S. and shipping to me is not a problem. I don't know about international shipping, sorry. What is the space in width between each screw hole? I am mounting rack onto studs, but there is concrete in between so I have to make sure it will fit on the wood studs. BEST ANSWER: Thank you for your inquiry. There is approximately 4.5" between each screw hole. If you have any further questions, please contact us directly at 800 356 8466. Thank you again. There are about 4.5" between each screw hole. How deep is this wine rack? BEST ANSWER: Thank you for your inquiry. The 6 bottle wine rack is 5 1/2". If you have any further questions, feel free to reach out to us at 800 356 8466. Thank you again. It is as deep as a bottle of wine. will this rack hold magnum size bottles? What is this made of? Is it metal? BEST ANSWER: Thank you for your question. You are correct this is made out of metal. Any other questions please call us at 800-377-3330. Hello, I need 2 of these wine racks. Can I get them sooner than the 1-2 weeks shipping time frame? I have mounted these racks on some vintage lumber pieces for gifts and in this case as a donation for an ALS Fundraiser. They turn out beautifully and are always appreciated. Perfect for my wine nook! I installed this in an open cabinet that hangs directly above my wine chiller. It just pulls the whole area in my kitchen together! Makes a perfect wine bottle holder for those with limited space. It was the perfect addition to my kitchen remodeling job. Had a space between the end of a cabinet and a wall that was needing something. The Le Rustique wis rack was just the right thing. It fit the space exactly and was a nice exclamation point to the cabinet. i'm very pleased. fit exactly where i wanted it,specs were dead on. Delivery was prompt and in perfect condition. This wine rack fits any shape wine bottle. Very sturdy and it came with mega strong wall fasteners. That wine rack is not going anywhere. It has a clean modern look. Highly recommended! Reclaims wasted wall space in my limited cellar and also is a good way to display some of my more special wines. Looks great, solidly made. 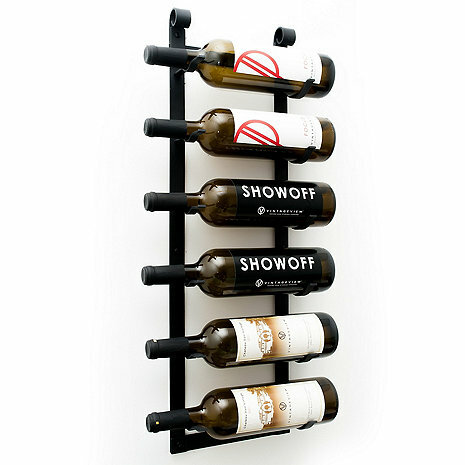 Doesn't take much space up and you can display your wines to show the labels while storing them correctly on the wall.